It has been almost fifty years since the first papers on the application of reliability theory to mining problems were published in the United States. Developing rapidly in the late 1950s and 1960s, reliability theory quickly found a wide application in mining engineering. Ten years later "Terotechnology" became popular in the UK and at the same time its counterpart "Theory of Exploitation" was introduced in Central Europe. Similar to reliability theory, they both found wide application in mining. Since then a lot of articles have been published in many countries concerning these scopes of considerations but a wider elaboration on this topic was still lacking. 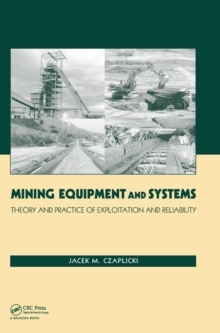 This book gives an explanation of the mutual relationships between terotechnology and the theory of exploitation, and presents the fundamentals of the theory of exploitation and its role in relation to mining engineering where mine machines and machinery systems are concerned. Further, statistical diagnostics, exploitation processes of machines, reliability and its models, and the methods of modelling and analysis of the processes of changes of states are treated. A significant part of the book deals with cyclical systems that are in common use. A variety of models are considered supported by many case studies. The last chapter deals with combined systems operating in a mixed manner. Finally, an analyses of the influence of the inhomogeneity of a different nature in a shovel-truck type system is given. The examples presented in the book are based on the data coming from operation of pieces of equipment from different mines and different countries. This book will be of particular interest to students, academics and lecturers of mining faculties and schools of mining. Mining Engineers and other professionals in the mining industry will also find this book of interest. Finally, students in mathematics will find practical applications and problem solving in this book.